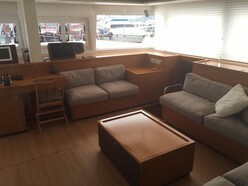 Moana, one of the most elegant performance cruising catamarans, is available for sale. 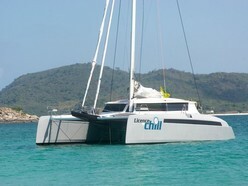 This fast 59ft catamaran comes in the 4 cabins version, ideal for a cruising family and/or plenty of friends. Benefit from the many small and large improvements made over the years. Winner of European Boat of the Year by all EU magazines in 2013 and Best Sailing Boat in the USA in 2014, hull #2 of this highly successful series is made for fast, yet comfortable and very safe navigation. Based on a VPLP design, this great catamaran sums up the know-how of the renowned French boatyard Outremer Yachting. Her first owners, both professional sailors ex-Whitbread and VOR, made her comfortable but without excessive added weight in order not to alter her Outremer DNA. On the other hand, they picked among the best available navigation and communications equipment, sails, rigging and deck hardware in order to ensure robustness as well as fast and safe passages. Embarking on a world voyage in 2012, Moana crossed the Atlantic and the Pacific; her second owners took her from New Caledonia to Australia, New Zealand, Tonga, Fiji, Vanuatu and French Polynesia. Upon concluding their cruising program in Papeete, her owners decided to ship her back to Europe via cargo ship. Therefore, Moana will arrive at La Grande Motte in May 2019, and will wait there for the new owners who will take her on new adventures. Moana is French-flagged and Europe VAT-paid. MOANA was hauled out for detailed inspection and repairs as required in 2016 (Boatworks, AUS), 2017 (Norsand, NZ) and 2018 (Norsand, NZ). Additionally, the mast was un-stepped and the rigging underwent a full Level C inspection/testing/repairs by Doyle Rigging in January 2018. MOANA is a proven, capable blue water cruiser with lots of options, meticulously maintained. Every system is extensively documented from a user’s perspective. This performance cruising catamaran is suitable for all types of sailing areas and will provide you with autonomy, comfort and safety. 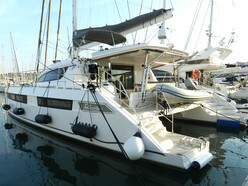 Private catamaran bought in 2008, second hand, in very good condition, German flag and, European VAT paid.